The moon and stars are ganging up on the sun... rebellion. Bands are more connected to their fans than ever before. It probably all started with MySpace when you really think about it. Their fans "friended" them and then the band could easily share music/tour dates and the all important "status" update. MySpace might have been the first place bands got familiar with status updates and blogs as a way of communicating with their fans. 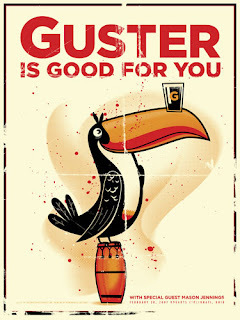 I first discovered Guster while I was looking for remixes to add to my DJ arsenal. I came across The Astronauts' remix of "Satellite" and became intrigued. I bought the album Ganging Up On The Sun after I sampled some of their other music I found around the web. The album was acoustic pop rock from beginning to end. Released in 2006, this happens to be their 5th studio album and is the last studio album the band has released to date. There is an album in the works for 2010, and I am stoked about hearing it. 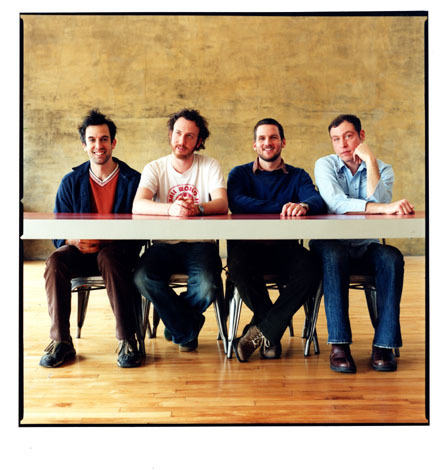 While researching Guster, I discovered that this is the kind of band that likes to connect with their fan-base through all the cool technological methods we have today. Like blogging and twitter, and the like. Manchester Orchestra had a video blog that consumed me for some time. I kept checking daily for new "episodes" on what the band was up to! Stalker-ish, I know. But it builds and strengthens a fan-base, in my opinion. You keep getting reminders about, and checking in with, the band. For example, when Manchester Orchestra announced they were returning to the studio to record a second album, I was excited, exponentially increasing, over the months they were working on it. Checking their photo blog and videos for shenanigans in the studio. Was I there on release day for that album? You bet. Be sure to check into the tour and studio blogs for Guster. Just to catch up. I can't wait to see all the new entries while they get together a new album and tour together this year. Before you check those out, take a listen to my favorite track off Ganging Up.... It's called "The Beginning Of The End".